LiteHawk LIL MAX is ready for adventure! Designed as a Rock Racer, the over sized wheels along with High Travel Suspension can easily navigate through rough terrain. 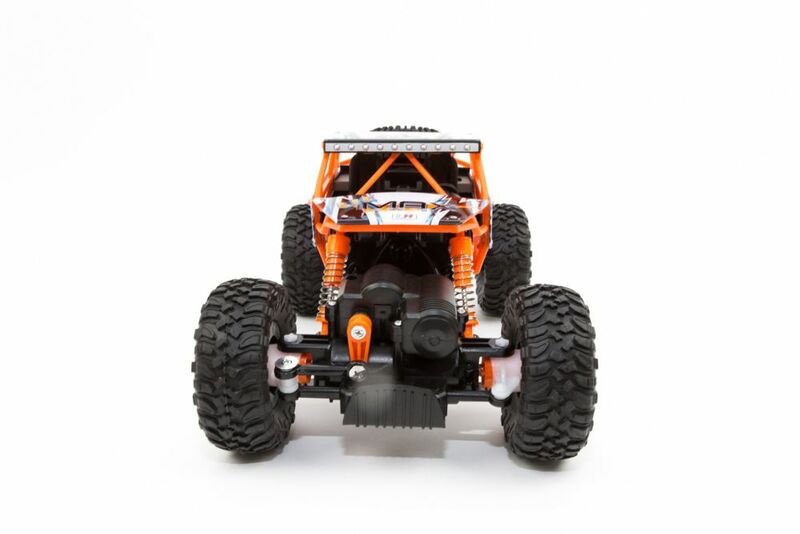 Its twin motor setup, delivers robust power to the front and rear axles - all controlled by you with the included 2.4 GHz Controller! LIL MAX sports a Heavy Duty Roll Cage that protects components in case of a roll over. Easily take your next adventure Off-Road with confidence - LIL MAX is an awesome 4x4!Raining outside? LIL MAX is very happy zooming across floors in your home - it will be even happier if you make a small Obstacle Course for it to play on! 2 Channel Fully Digital 2.4 Ghz Control puts you in control! Play together with up to 80 models at the same time without the fear of losing connection! Steering wheel can be installed to suit both left and right handed drivers. 20 Minute Run Time! LIL MAX Rock Crawler Radio Controlled Vehicle LiteHawk LIL MAX is ready for adventure! Designed as a Rock Racer, the over sized wheels along with High Travel Suspension can easily navigate through rough terrain. Its twin motor setup, delivers robust power to the front and rear axles - all controlled by you with the included 2.4 GHz Controller! LIL MAX sports a Heavy Duty Roll Cage that protects components in case of a roll over. Easily take your next adventure Off-Road with confidence - LIL MAX is an awesome 4x4!Raining outside? LIL MAX is very happy zooming across floors in your home - it will be even happier if you make a small Obstacle Course for it to play on! LIL MAX Rock Crawler Radio Controlled Vehicle is rated 4.0 out of 5 by 1.